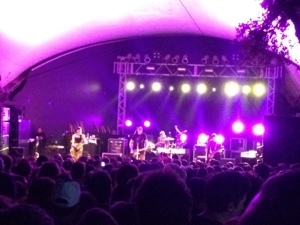 Brian and I are downtown at Stubb’s waiting to hear one of his favorite bands of all time– The Smashing Pumpkins. Yup. Just said that. I’m at a Smashing Pumpkins show. Me. Folksy, bluesy, indie me. But I love my husband. And they serve beer here. So I’m good. He’s excited and I’m excited for him. Wish I’d brought earplugs, though. Or my mosh pitting shoes. Sigh. This entry was posted in Marriage, Our First Year and tagged anything-for-my-husband, concerts, married-life, smashing-pumpkins by Lindsey. Bookmark the permalink.